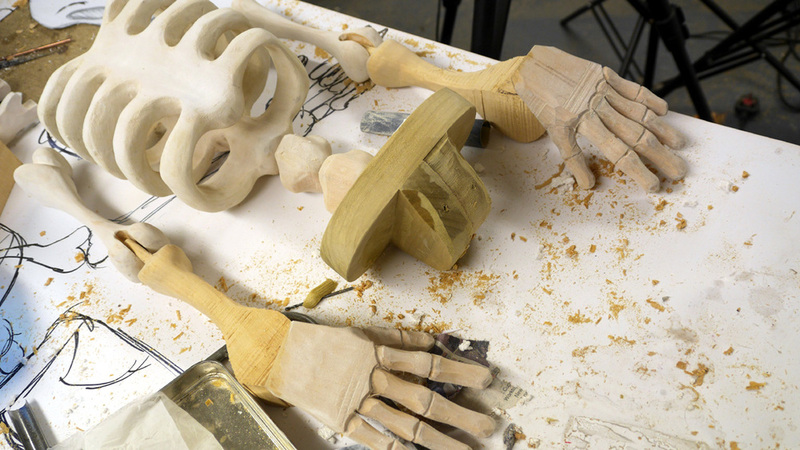 In May Mr Paul Foot contacted me to discuss making a marionette for his next show - 'words'. 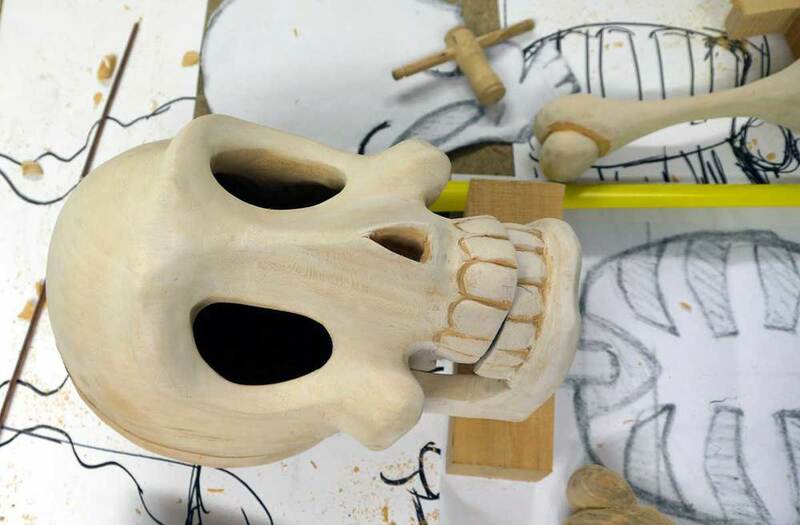 He wanted me to build a puppet of the character 'Skeleton Johnston' and he wanted it to be as large as possible so it could be easily seen in the larger venues. We discussed the best way to achieve this given that it would have to be sturdy enough to withstand travel around the country (and possibly abroad) without damage. It also couldn't be so big it was difficult to operate as you don't really want to have your arms at more than a 90 degree angle for long periods of time holding a larger marionette. The weight was also going to be a very key factor. In the end we decided that the best option for durability - and ease of repair if it came to that - would be wood. I would have to make all parts as light as possible though given the size so this would mean hollowing out the head and ribs and thinning the arms and legs as much as I could. The character would stand around 90cms tall (not including hair) and this would mean the controller would be just over a metre from the ground which worked out about right for Paul's height. So after a scale and then a full size drawing I started the carving. I made the skull first and was quite happy with how it turned out. Next onto his hair, I figured the best way to create his crazy ice cream scoop style was with some hard foam unfortunately I had run out - as had my local store - and as this was an urgent project I wondered about using some expanding builders foam which I had on the shelf. First I inserted a long screw through the top of the head to give the foam something to bind to, then I squirted a good dollop onto his head. After letting it dry for a couple of hours I cut it with a hacksaw blade. It ended up with quite a few air holes in it so I wrapped the shape in masking tape, made a couple of small holes and squirted a good amount in again. This seemed to work, filling all the voids and making a nice tight foam. A little final trimming and it was read for the cotton hair to be stuck on the shape. I created the ribs in two halves and hollowed the middle. Arms and hands were also carved from Limewood as were his shoes. I used some Idigbo for the legs and pelvis as this is quite a light weight wood but still sturdy. The legs were not shaped other than a little bit at the ankles, just in case his trousers were to ride up. I used 3mm rod for all metal joints and some elastic at the shoulders. Once i'd made his trousers and braces, all that was left was the control. As you can see its a simplified rocker bar operating the legs, there is a wire through the top of the head for support and control. The jaw string can be operated with one finger on the holding hand. The operation of the marionette is quite simple but even so can give a lot of movement and expression. I delivered Mr Johnston to his new friend Paul Foot and spent the afternoon showing him the movements and giving a few puppetry tips. Paul was really quick in getting to grips with him and seemed happy that this would work really well in the specially created section of his new show. 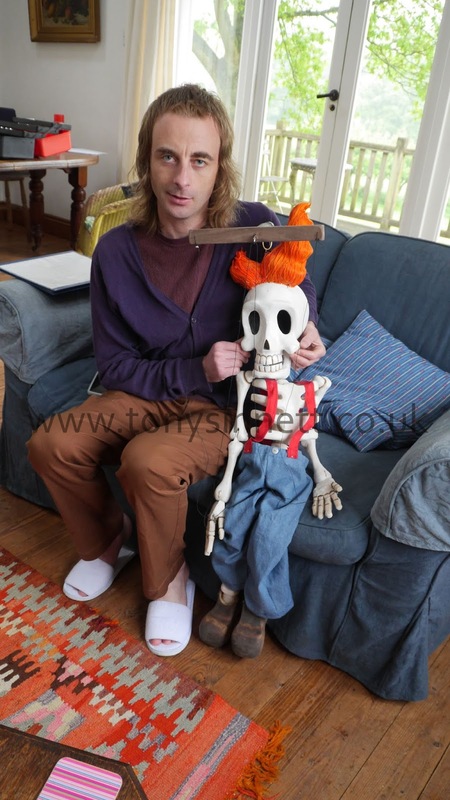 Here is Paul Foot with Skeleton Johnston.